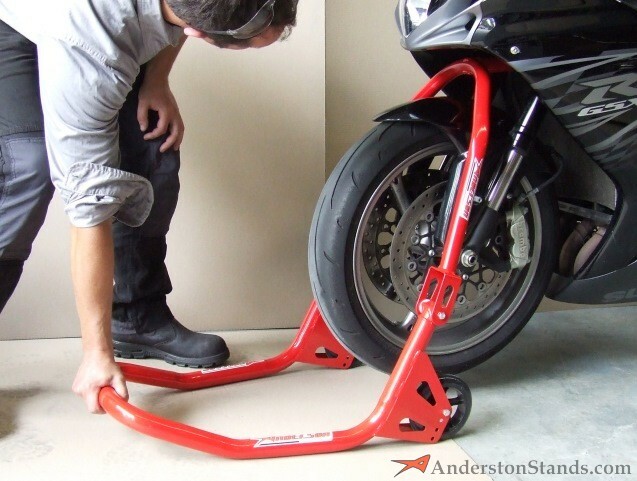 This stand lifts from the bottom of the fork legs, and allows the removal of the front wheel. Fits almost all bikes. 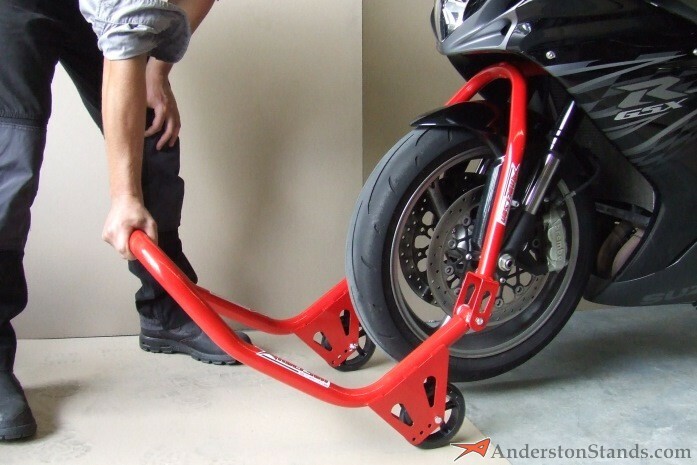 It must be used in conjunction with a rear stand to ensure stability. These are a machined plastic block which pivots on a shaft, and cups the end of the fork leg. Some bikes have axle pinch bolts on both legs, and some have them on one leg only, so the length of the forks below the axle centre varies. To accommodate this, the pivot shafts that the blocks are mounted on are machined eccentrically, so by turning one mount block 180 degrees they will sit at different heights to match the fork legs. 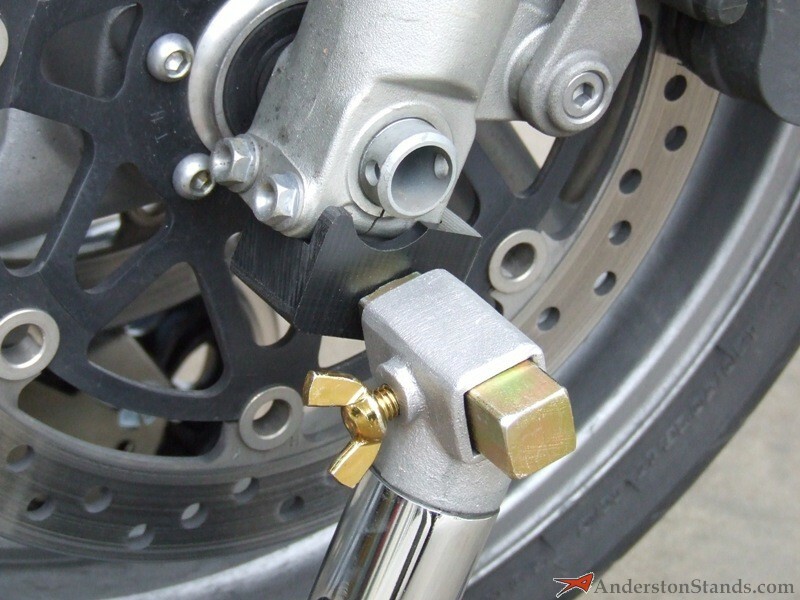 These attachments are used for bikes with radial mounted front brake calipers. They lift under the structure attached to the fork leg which holds the brake calipers. The calipers can still be removed. This stand is height adjustable like our Universal rear stand. There are a few models which this stand won't work on - the BMW K1200 and 1300, as well as the pre-radial caliper MV Agustas. We have special frontstands to pick these bikes up. 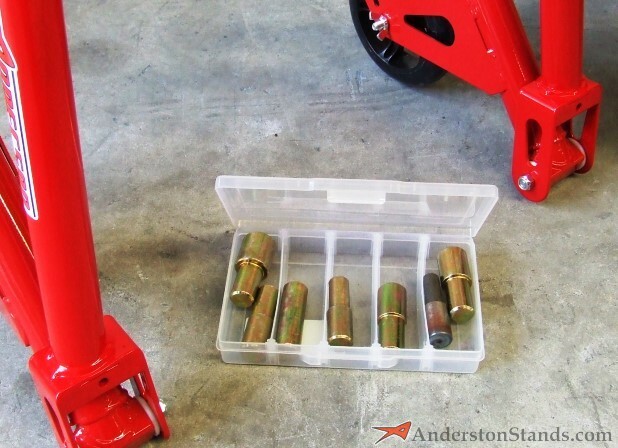 These stands lift under the bottom fork crown, so they allow the removal of the forks as well as the front wheel. 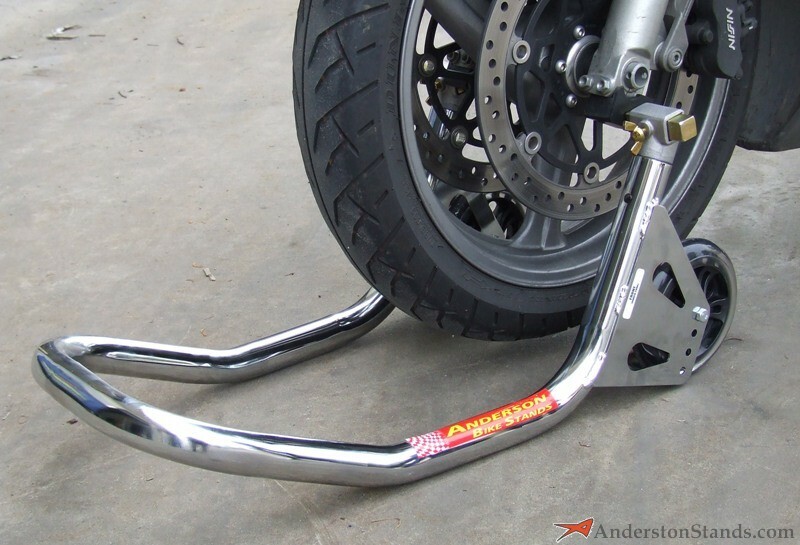 Like the other front stands, they need the bike to be supported on a rear stand before using them. Our new design of SHL has been simplified, and now fits a wider range of bikes. 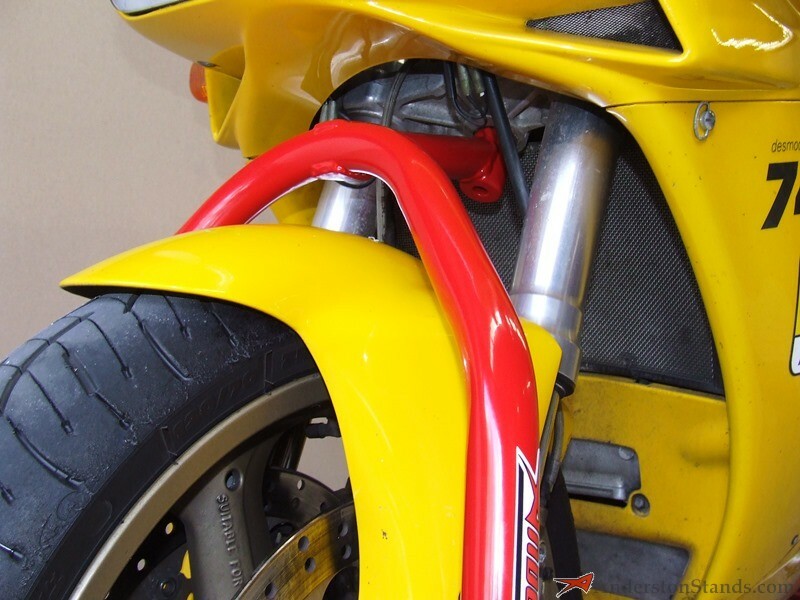 Unlike our previous models, and most other brands of stands of this type, there is now no lifting arm projecting out under the nose of the fairing. 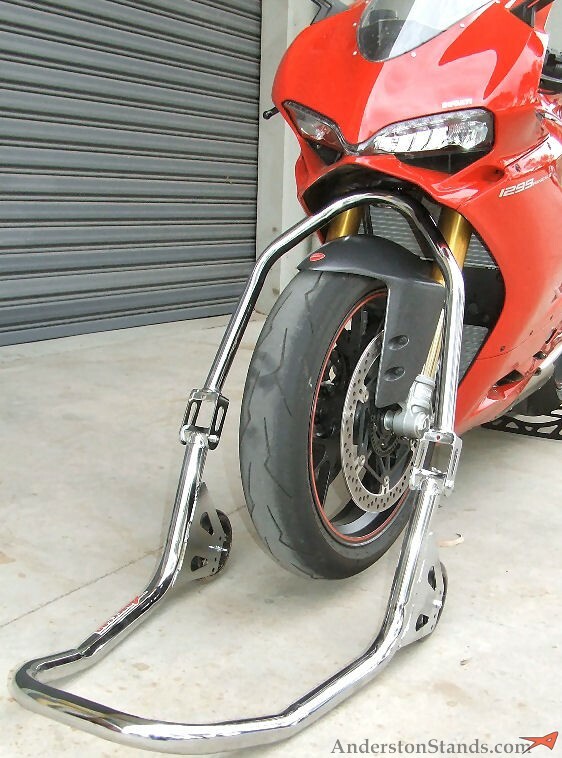 So this stand will still work on bikes with long, low fairing noses, without any danger of the stand touching the fairing. 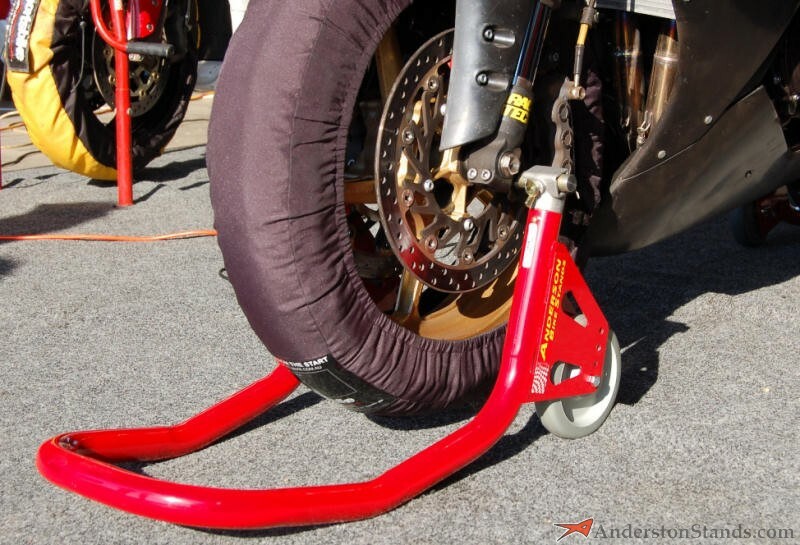 This stand will even work on the Ducati Panigale. 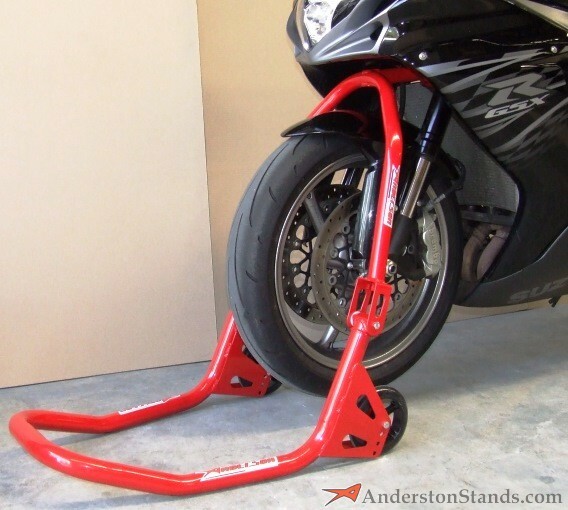 - the legs of the stand stay forward of the forks, allowing easy side access to the brake calipers and axle. 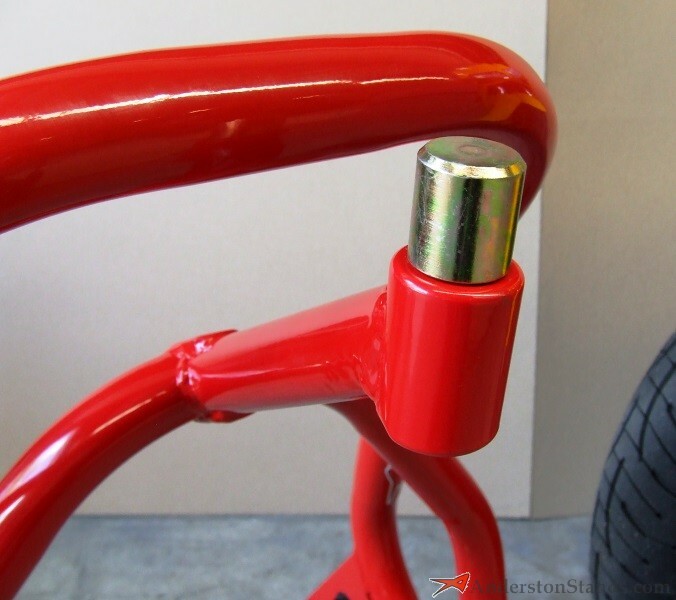 They utilise a lifting frame with a pin which fits into the hole in the bottom of the bike's steering stem. 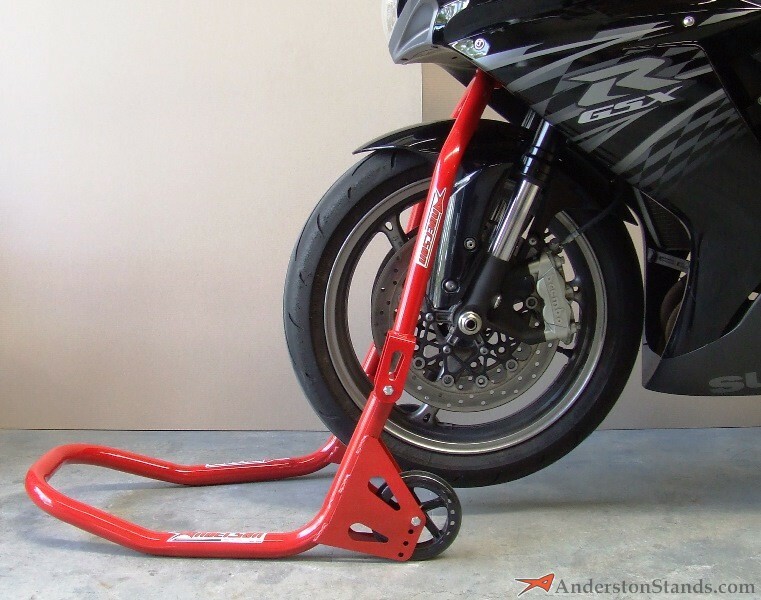 Once the pin is inserted, the lifting frame becomes like an extension of the bike's frame - a stiff handle which can be used to lift the front of the bike. NOTE: Many 8 valve Ducatis (pre Panigale models) and MV Agustas do not have a hole in the steering stem, so this type of stand will not be suitable. For these models you will need to use the Mk5 stand. 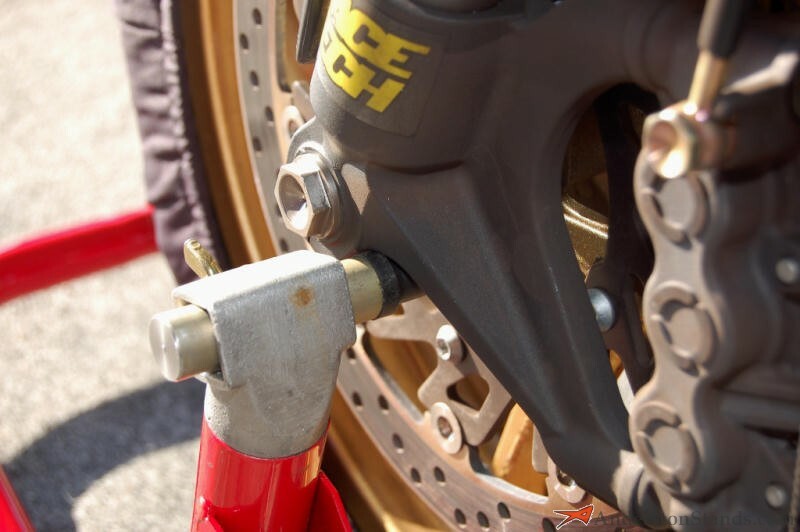 This stand was designed for use on MV Agustas and all 8 valve Ducatis (prior to the Panigale models) which don't have a hole in the steering stem, and which cannot be lifted with a standard steering head lifter. The MK5 uses a different lifting principle so it doesn't need the hole in the steering stem - the arm is stiffly attached to the stand and the stand has long side supports which place it's wheels beyond the reach of the arm and therefore stop the stand from tipping. Like the other stands the bike needs to be supported on a rear stand before use. 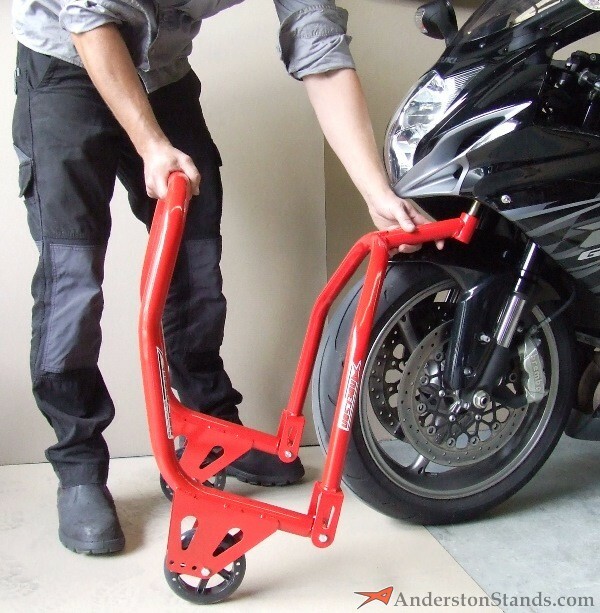 Once the bike is lifted the handle can be removed to facilitate front wheel removal. 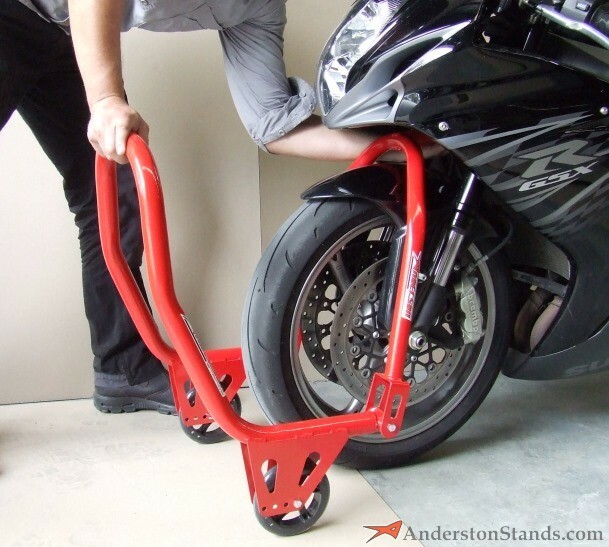 The lifting arm has a reversible lifting attachment which has a pad on 1 side suitable for the bikes with no hole, and on the other side a pin which allows it to be used on bikes with a hole. Because the pin doesn't have to lock into the hole (as on the standard steering head lifter) it doesn't matter what size the hole is, so one pin does the job.